Star Chronicles by Dawnita Fogleman. As much as this is a study of stars and constellations, it is equally a Bible study. 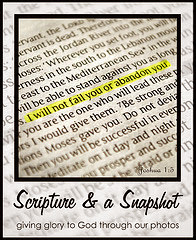 Truths that Dawnita teaches are paired with corresponding Scripture verses. One such example is when she shares that Aquila means flying eagle. The author references Psalm 91: 4-6 and shares that the eagle is protecting God's people from the arrow of the enemy. I've read of stars in the Bible including the star of Bethlehem, but I've never before read a book that so clearly gave Scripture examples for every constellation. I was fascinated by this study. Ladies interested in a not so typical type of Bible study and homeschool families with children of all ages will find this useful and enlightening. 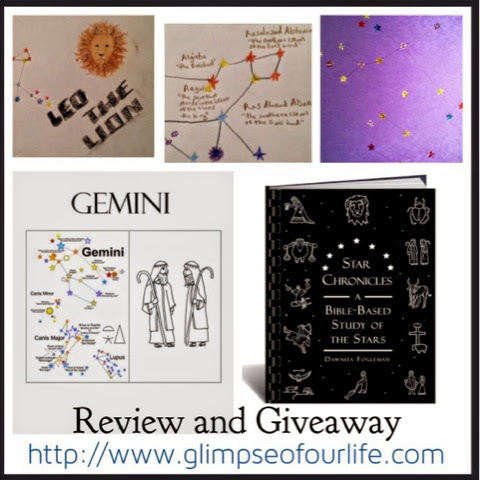 The author also called it a Homeschool Unit Study of Constellations and Gospel Prophecy. "This is a unit study on the constellations and Bible prophecy. When I did this study with my own children it was out of a desire to get to the bottom of the Stars. No, that doesn't sound right . . . I wanted to get to the truth. I started with Dr. E.W. Bullinger's book “The Witness of the Stars.” To tell you the truth, while the book fascinated me, I thought a lot of it seemed a bit far-fetched. So, the study began and in order to excuse the time spent, I involved the children and counted it as school! We literally scrap-booked our way through the stars. If you have read Bullinger's book, you may find little here that truly coincides. 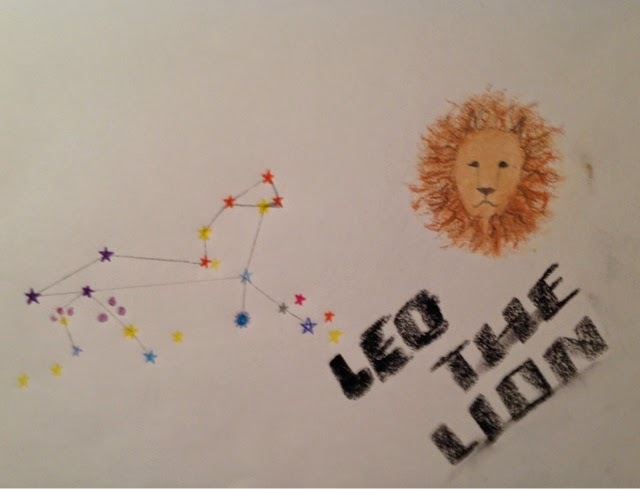 I used his basic format for the partners he places with each main constellation in his book. I list only the stars I found confirmation for in wikipedia. Sometimes I did have to dig through some mythologies and zodiac rubbish in order to get the information that seemed relevant for the purpose of this book. 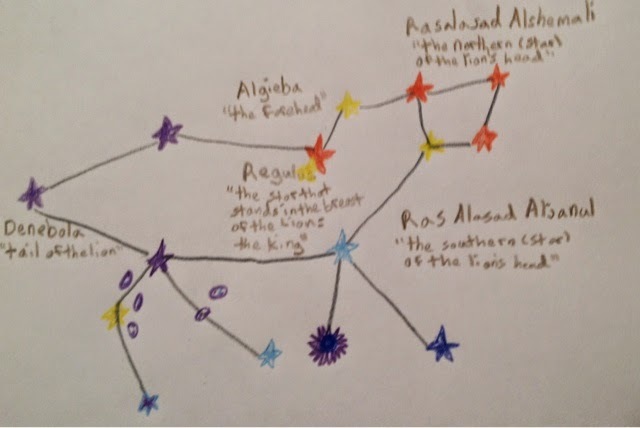 Some Bible references are merely what the star names or star-picture reminded me of. I've tried to make this engaging and fun, rather than overly scientific or theological." The book is about 56 pages, not including notebooking and coloring pages. Dawnita shared how her own children created a scrapbook when they studied these lessons together and gave examples we could follow to do the same. 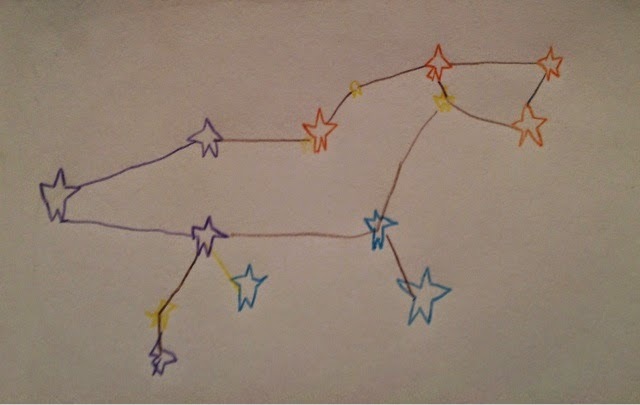 My kids have been enjoying art lately, so we decided to draw some of the constellations using her color code system, too. They also choose Leo the Lion to draw, and you can see those pictures shared in our Virtual Refrigerator post earlier this month.They enjoyed hearing the lessons which I read aloud as they drew. Names of each star were shared in each constellation and surrounding stars. Meanings were also discussed in detail. The relationship of the constellations to specific events or people in the Bible was specified. 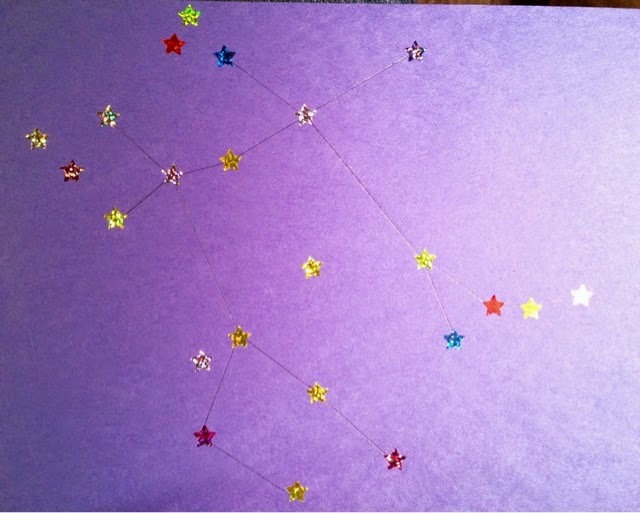 My daughter made a sticker art replica of the Gemini constellation. Notice the color coded stars. Coloring sheets can be printed for children to complete as you read the lessons aloud to them. This book opens up with Psalm 8 then continues to have KJV Bible verses shared liberally throughout the pages. A field guide to the stars is listed as an optional resource, a Bible is mandatory though most references are shared in full in the text. Color pictures illustrate the lessons. This study fascinated me. 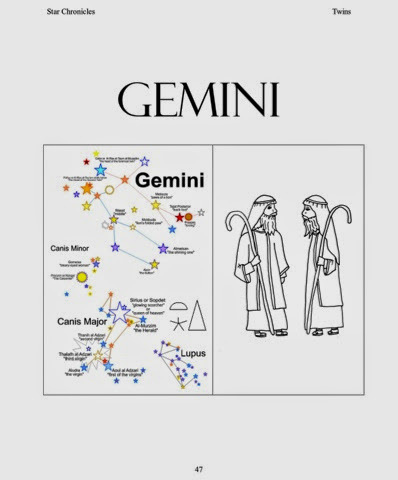 I had never before heard of the names for the constellations in a Biblical context, only as zodiac signs. I loved seeing how the heavens so clearly do declare the glory of God in more clear ways than I realized before. I am thankful for the research that Dawnita put into this study. As she shares about Virgo the bride, she reminds us that Jesus repeatedly referred to himself as the bridegroom. Smaller constellations and galaxies around the main ones are also discussed. Crux, for example, by Libra, is the cross, and Lupus beside it is an animal that has been slain. We learned that though Cancer is usually considered to be a crab, it is actually a dung beetle. Apparently the Egyptians thought their metamorphosis was magical. Additional references are shared for continued study. Where did you find the information linking the Sphyinx to Prophecy and Astronomy? Star Chronicles is available as an e-book directly from Dawnita Fogleman or as a physical book from Amazon. (affiliate links) The e-book is $12 but through April 20th you can get 25% off the e-book with the code STARMOMS The paperback version is currently on sale for $22.12. There is also a free sample chapter through the e-book link. I've been authorized to giveaway one PDF copy of Dawnita Fogleman's book Star Chronicles: A Bible-Based Study of the Stars. Enter through this Rafflecopter giveaway link. This giveawat is not limited by your location. This giveaway ends April 18th. Winner has 48 hours to respond to email or another winner will be chosen. This looks great! We've been talking about doing Astronomy for science next year, the timing is perfect! Thank you for this in-depth review! I am amazed at how differently each family has connected with this study. I'm glad it is meeting a need and spurring more interest in God's Creation. Blessings! Thank you, Dawnita, for this review opportunity. You have blessed me again. What an awesome book/review! I would love this resource! Is this giveaway open to Canadians too? I'm glad you asked. I'll go back and specify in the post. YES! This is a PDF download so open to everyone.